Brake system performance begins with a pedal or leverage device that provides the operator with a comfortable effort requirement and confident, controlled response from the overall system. Wilwood offers brake pedals, hand levers, and master cylinder mounts in a variety of configurations to provide options that suit nearly every type of competition or custom built vehicle application. By selecting any of the links below, you can browse each pedal type, see mounting dimensions, and find additional technical information on every pedal. If you need additional information, or would like to place an order contact our technical experts at (805) 388-1188. 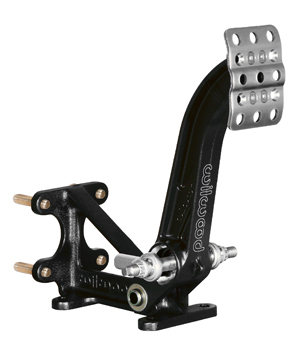 The Wilwood standard pedal group include all single cylinder mount clutch or brake pedals, and all multiple cylinder balance bar brake pedals and master cylinder mounts that utilize the traditional slide bearing balance bar adjuster to affect pressure differential changes between the front and rear circuits. The slide bearing balance bar provides excellent utility service for mechanical bias adjustment. When the balance bar bias is adjusted, the center pivot bearing moves laterally within the pedal arm to affect the load sharing ratio between each master cylinder and resulting pressure differentials. 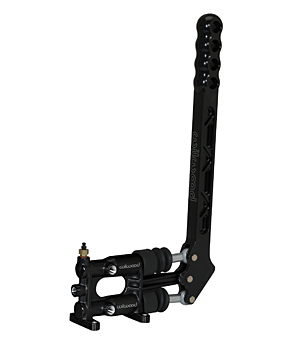 Wilwood hand brake levers provide high leverage control for manual actuation of one or more brake calipers. Each handbrake lever is forged from a premium aluminum alloy with an integral and ergonomic full length hand grip. Each lever features an 11:1 ratio providing the operator with the ability to generate fast response with comfortable effort. The single cylinder mount model can be used as either a stand-alone system with a dedicated, gravity fed fluid reservoir, or as a pass-thru system plumbed in serial in the pressure line from the foot controlled master cylinder. The single cylinder mount model can be used to actuate one or more calipers operating on a common fluid circuit. 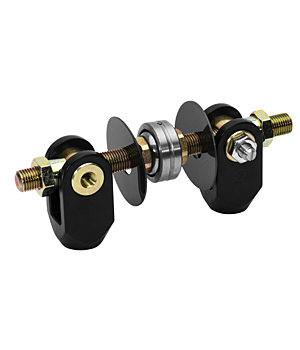 These type of hand brakes are well suited to dragsters for staging brakes or auxiliary stopping brakes, drift cars, and any application where the use or addition of a handbrake is desired. These brakes however should not be confused with a parking brake lever. They cannot be locked into position to hold static pressure on the brake system for parking purposes. Cutting brakes, also known as steering brakes, incorporate a pair of integrally mounted ¾” bore master cylinders that can function independently to operate separate brake calipers within their common circuits. The system acts as a flow-thru design when the lever is not applied. 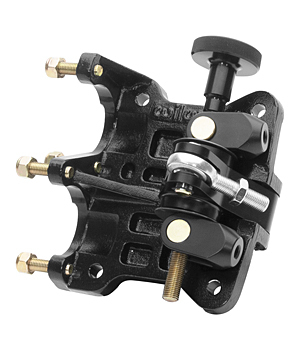 This allows full pressure from the foot operated master cylinder to travel to both the left and right calipers on the axle(s) simultaneously. When the cutting brake lever is pushed or pulled, only the caliper connected to the cutting brake lever master cylinder that is being compressed will be actuated. This action is used to affect a change in vehicle direction by applying brakes on only one wheel or one side of the vehicle. Cutting brakes have wide spread use on off-road buggies and other competition vehicles where auxiliary steering capability through the use of individual wheel braking provides benefit through additional control capability by the operator. 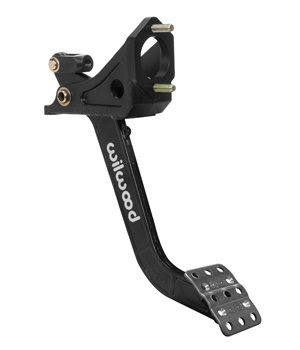 Wilwood’s new floor mount pedal assemblies has a brake / clutch / throttle triple pedal design. 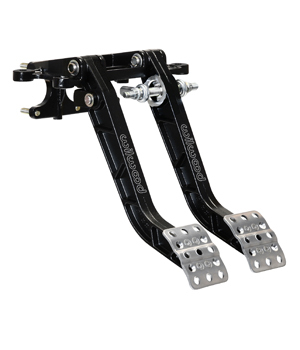 There are three individual fabricated steel pedals with non-slip pedal pads to control brake, clutch and throttle. 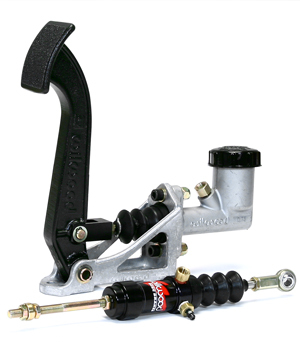 Wilwood’s new Swing Mount Tandem Brake and Clutch Assembly simplifies installing a tandem outlet master cylinder and a hydraulic clutch master cylinder in a forward position outside the firewall. 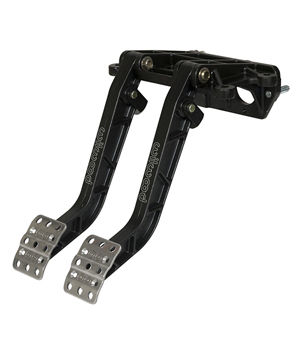 This swinging mount clutch/brake pedal assembly is often used as a clutch pedal with a single outlet master cylinder, or as a brake pedal in conjunction with dual outlet, tandem master cylinders. Available in a reverse facing position. 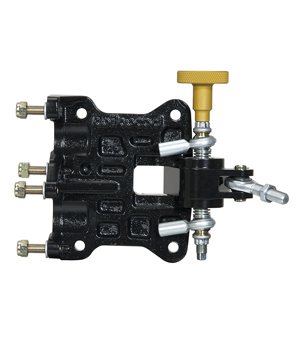 This lightweight unit is ideal for Dirt Modifieds, Champ Cars, Sprint Cars, Midgets, or any application where the master cylinders and bias balance bar must be mounted in a remote location from the pedal.the master cylinders are mounted at 60 degrees. 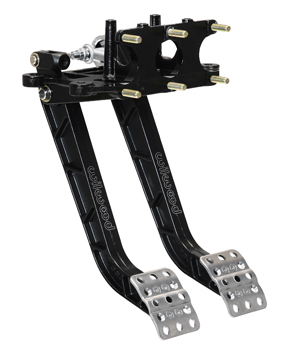 Wilwood’s Clutch Pedal Kit comes with either a floor mount clutch pedal of a 6 to 1 ratio or a swing mount with a 7 to 1 ratio, Integral Reservoir Master cylinder in a ¾ bore and universal pull type slave cylinder. 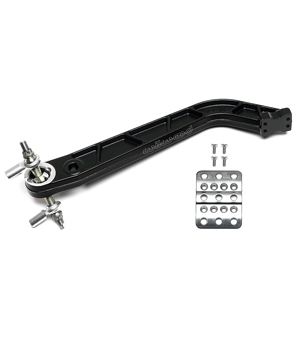 Accessories and replacement parts for Wilwood pedals. 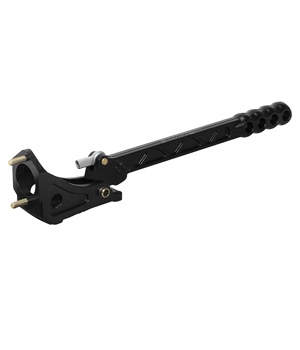 Wilwood handbrake lever assemblies provide a lightweight, high-leverage component for drift cars, drag race cars and rally cars or any application where hand-actuation of one or more brake calipers is employed. 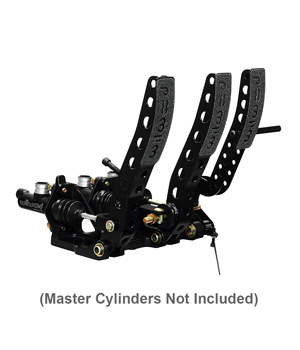 Wilwood's Dual Cylinder Inline Cutting Brake kits utilize a single inlet, twin outlet flow-through master cylinder to simplify plumbing of the existing calipers and deliver precise steering-brake control for all types of off-road competition vehicles.